Wife of US Ambassador to Libya Gene Cretz and Military Attache place wreath on the graves of the five sailors of the USS Intrepid at the Old Protestant Cemetery in Tripoli. 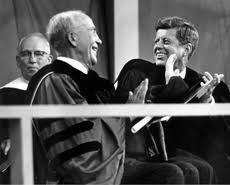 Archibald MacLeish and President John F. Kennedy. He was born in Glencoe, Illinois, the son of Andrew MacLeish, a prosperous dry-goods merchant, and Martha Hillard, a college professor. Andrew MacLeish was a reserved, stern father whose lack of attention to his son may have generated Archibald's fierce drive to succeed. The influence of Martha MacLeish, who worked to develop her four children's sense of social responsibility, helps account for Archibald's intense involvement in American public life as well as his concern for those in personal or political trouble. 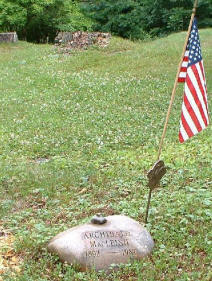 MacLeish spent his childhood on a seventeen-acre estate on Lake Michigan. He was a somewhat rebellious though industrious child who needed, his mother judged, the discipline of a private school; he therefore attended Hotchkiss from 1907 to 1911. At Yale (1911-1915) he majored in English, wrote poetry, and was heavily involved in campus literary, social, and athletic activities. After graduating from Yale, he entered Harvard Law School in the fall of 1915. In June 1916 he married Ada Taylor Hitchcock; they had four children, three of whom survived infancy. MacLeish's first volume of poetry, Tower of Ivory, appeared late in 1917 shortly after he had left for France and World War I to serve in the Yale Mobile Hospital Unit. He soon transferred to artillery school and eventually saw action in the second battle of the Marne, commanding Battery B of the 146th Field Artillery. He was then ordered back to the United States to instruct draftees in artillery use and was there, a first lieutenant, when the war ended. MacLeish became embittered toward the war when his brother Ken, a fighter pilot, died in combat, but this disillusionment (best expressed in the poem "Memorial Rain" ) would not prevent his appreciating the need to oppose fascism in the thirties. Returning to Harvard Law School, MacLeish graduated at the head of his class in 1919. He then taught law courses for a semester in Harvard's government department but turned down an offer to teach at the Harvard Law School; he worked briefly, instead, as an editor for the New Republic. In September 1920 he joined the Boston law firm of Choate, Hall and Stewart. He was a successful lawyer, but feeling confined by the profession and craving time to write poetry, he quit the firm on the same day he was offered a partnership in February 1923. Though he always felt an obligation to society, MacLeish believed at this time that he could pay his debt simply by creating poetry: "it was the art I owed," he recalled in Riders on the Earth. In September 1923 the MacLeishes headed for Paris, he hoping to become an accomplished poet and she to become a professional singer. There they joined the expatriate literary community, meeting writers such as E. E. Cummings, John Dos Passos, Scott and Zelda Fitzgerald, James Joyce, and Ernest Hemingway. With Hemingway, MacLeish began a long and close though difficult friendship. Always an organized worker, he established a program of reading to develop poetic style and technique. Perhaps he studied too well, for during the Paris period he wrote several long poems, which sounded much like T S. Eliot, Ezra Pound, and other pioneering modernists (The Pot of Earth , Nobodaddy , Einstein [1926, in Streets in the Moon], and The Hamlet of A. MacLeish ). But he also wrote short poems equally notable for lyrical grace and a tone of muted horror at the human experience of spinning on our small planet through the dark and empty universe, as in "You, Andrew Marvell." This poem and other lyrics--such as "Ars Poetica," "The End of the World," "Eleven," and "'Not Marble Nor the Gilded Monuments’"--have long been the source of MacLeish's poetic reputation. The MacLeishes returned to the United States in 1928 and bought a farm in Conway, Massachusetts. "American Letter" in New Found Land (1930) asserts his commitment to the United States, despite the pull of Europe. The long poem Conquistador (1932) presents Cortes's conquest of the Aztecs as symbolic of the American experience. In 1933Conquistador won the Pulitzer Prize, the first of three awarded to MacLeish. MacLeish worked for Henry Luce's new magazine Fortune from 1929 to 1938, writing voluminously on the American and international scenes. His production of poems, essays, and plays was also prolific. In them MacLeish carried on a debate with himself about the relation between art and society. He rejected the modernist emphasis on the private individual's experience and the poet's alienation from society. The poet, he came to believe, was inevitably involved in society. Poetry, especially in a tumultuous time like the thirties, should be "public speech." His stage and radio plays of the thirties, notably Panic (1935), The Fall of the City (1937), and Air Raid (1938) aimed at and sometimes reached a wide audience. MacLeish was strongly criticized during the thirties not only for specific opinions, but for apparent inconsistency. He argued each position as though it were eternal truth, yet from poem to essay to play both his political views and his sense of the writer's social role varied as he worked out, in print, what he believed. By the late thirties he had achieved a consistent position, a vision of human freedom, dignity, and solidarity that was inevitably at odds with fascism, communism, and the excesses of American capitalism. What was wrong with America, MacLeish decided, was that Americans lacked a clear vision of their human potential as well as their national goals. But he believed that poetry could supply it. At times he argued that only poetry could provide a unifying cultural vision. He tried to capture it in poems, plays, and a book of photographs, Land of the Free (1938), for which he supplied the text, but none of his formulations of "an image of mankind in which men can again believe" (Poetry 38 : 216) caught the public imagination. He did catch, however, the scorn of modernists for ignoring the supposed separation of art and politics and writing "public poetry" about the need for brotherhood and a common cultural vision. He was criticized also for transforming his poetic theory and practice from the vintage modernism expressed in "Ars Poetica"--"a poem should not mean / but be"--to a public poetry that commented directly on social and political issues, as if the Great Depression and the rise of fascism might not give one second thoughts about fundamentals. Politically during the thirties MacLeish was developing a liberal humanism that made him admire Franklin D. Roosevelt, for whom he later wrote speeches. Along the way he took hits from all sides; the Left attacked him as an "unconscious fascist" and the Right as an associate of communists. In 1939 J. Parnell Thomas coined the term "fellow traveler" with specific reference to MacLeish on the occasion of his nomination by President Roosevelt to become librarian of Congress. In this position he applied his formidable administrative talents to reorganizing and modernizing the inertia-bound Library of Congress. He also directed an information/propaganda agency called the Office of Facts and Figures in 1941. The agency lasted less than a year and lacked the authority to accomplish much. MacLeish then became assistant director of the Office of War Information (1942-1943). He wrote little poetry during this period but in essays and speeches continued to argue for freedom and communal solidarity, not just to overcome fascism but to promote and exercise the freedoms on which the United States was based. In 1944 MacLeish resigned from the library and prepared to return to private life. Roosevelt, however, appointed him assistant secretary of state for cultural and public affairs. In 1945 he resigned this position and led the U.S. delegation to the organizational meeting of UNESCO, and in 1946 he served as assistant head of the U.S. delegation to UNESCO. Only after that did he return to private life. Act five and Other Poems (1948), MacLeish's first poetic volume since America Was Promises (1939), contained public poems and private lyrics. The hortatory, activist stance of the thirties was gone, replaced by disillusionment with the political world. Actfive asserts that in the failure of the state, science, industry, heroes, and "the Crowd," nevertheless "The heart persists. The love survives." There remains the impulse to be "beautiful and brave," "dutiful and good." MacLeish became the Boylston Professor of Rhetoric and Oratory at Harvard in 1949. He held this position, teaching a seminar in creative writing and a lecture course in poetry, until mandatory retirement in 1962. Teaching only in the fall semesters, he had ample time to write. During the fifties he achieved gratifying successes and a balance between his public and private work. Collected Poems 1917-52 (1952) brought not only his second Pulitzer Prize, but Hayden Carruth's apology for the past carping of critics (Nation, 31 Jan. 1953). MacLeish was elected president of the American Academy of Arts and Letters in 1953. He tried unsuccessfully to involve the academy in confronting the anti-Communist hysteria of the time. He fought McCarthyism during those years in essays, poems, and the play The Trojan Horse (broadcast and published in 1952) and by standing up for those whom Senator Joseph R. McCarthy threatened. After visiting Ezra Pound in 1955, MacLeish worked tirelessly to obtain Pound's release from St. Elizabeths hospital, a goal accomplished in 1958. That same year he published. J.B., his reworking of the story of Job that, as a book and as a Broadway play, became his greatest popular success. J.B. brought MacLeish his third Pulitzer. After his retirement from Harvard in 1962, MacLeish, always an energetic person, slowed his pace only gradually. He was a public resource in politics as well as literature, writing often for public celebrations and commemorations. And he accomplished a long-frustrated goal, locating in 1968 a vision of human existence that had a broad public impact, when he reflected for the New York Times on the first photograph of the earth taken from beyond the moon (the Apollo 8 voyage). It was an image with whose help "man may discover what he really is": "To see the earth as we now see it, small and blue and beautiful in that eternal silence where it floats, is to see ourselves as riders on the earth together, brothers on that bright loveliness in the unending night--brothers who see now they are truly brothers (Riders on the Earth, p. xiv). In his later years MacLeish wrote excellent lyric poems that reflect in a direct, personal tone on love and aging. Not that he lost the desire to advise and exhort; the play Herakles(1967) warns of the destructive potential of science. But the short lyrics constitute his best poetry after J.B. It can be argued that these later poems are as good as his famous poems of the twenties. He died in Boston. Once considered a major modernist poet of the generation that followed Pound and Eliot, MacLeish remains notable as one of those who influenced the development of modern poetry. With his sensitivity to technique and his lyrical gift, he expressed common existential anxieties of the time. And no poem has expressed the modernist sense of art so well as "Ars Poetica" (1926) with its signature statement: "A poem should not mean / but be." This long neglected subject caught the interest of Chris Dickon and he has done a masterful job of researching the facts and presenting them in an interesting and readable way. Well documented with extensive footnotes, a reliable index, appendix and many photos, Dickon’s book will certainly be the primary reference work on this subject for many years to come. While this book chronicles the changes in attitudes about the care for the graves of those killed in combat, it is also timely and pertinent in regards to the graves of the first known combat casualties abroad – the remains of the 13 officers and men of the USS Intrepid who were buried in Tripoli in 1804 and remain there today. That would be John Paul Jones, who Teddy Roosevelt had repatriated from his grave in Paris and reburied at Annapolis, and Richard Somers and the men of the Intrepid, who still remain buried in Tripoli today, five in marked graves at a walled cemetery and eight buried under a Martyr’s Square outside the walls of the old castle fort. From the Shores of Tripoli to the Halls of Montezuma, Flanders Field and Normandy, Dickon’s book chronicles the fascinating story of the burial of American war dead, and describes how the American Battle Monuments Commission (ABMC) owns and oversees the maintenance of the foreign cemeteries, though not the graves in Tripoli. As Dickon returns to the status of the situation in Tripoli at various times in the chronology, it is a recurring theme that brings the history into the realm of current events that are still happening in revolutionary Libya. While Dickon’s subject is brought up on Veteran’s and Memorial Day every year, when flags are placed on the graves and those veterans who have died are remembered, their sacrifices are also recalled whenever our traditions and values are threatened, or when taken for granted. It is up to us to speak, and as Dickon concludes, this fascinating story must be taken to the children, so the living remembers the dead and what they died for. Somers Point, N.J. Mayor Jack Glasser: Richard Somers and the crew of the Intrepid are lying in a hostile country, a hostile land for many years, and I can’t understand why they are still there in Libya. For the life of me I can not understand why we left them there for 206 years - in Libya. I just can’t understand it. We had the country at one time, why didn’t we just bring them back? In this town, not only I, but there are so many people in this town with a passion to bring them home. It’s time to bring them home. That’s my saying - it’s time to bring them home. We have Congressman Mike Rogers from the great state of Michigan, and our own Frank LoBiondo, has been championing this cause in Congress for many years. They have introduced bill 1497 to bring the crew of the Intrepid home. It’s time that our government get on board with this, using a Navy term, to get on board with this, and stand behind this and bring them home. Walt Gregory: I’ve heard all the arguments. I’ve heard the argument that they don’t bring the bodies out of the Arizona. That is a ship that was sunk, and that is their grave, that is an honored grave. They say that they don’t bring the guys home from World War I from Flanders Field. But that is American territory. American flags fly over it. There’s a big difference between that and what we have. What we have is thirteen of our sailors buried in a foreign country, and it’s a hostile country. And we don’t know if they will stay there forever, we don’t know if we are going to get them soon, but we’re trying, we are trying to bring them home as best we can. John Morsa – By bringing Richard Somers back, by bringing him and his crew back, their stories can be better told, and not just told, but understood, and the lessons that they have are important. That’s why it’s of the utmost importance we should bring them and every service man home to a final resting place. Author, historian William Kelly: I think it is important that we bring Richard Somers home not only because of the Somers family who want it, but for the state of New Jersey and for America. I think it’s important that we call attention to these men, though because this is 200 years old the military seems to be balking about it, but there is no difference between what those men were fighting for then and what we fight for today. John Morsa: We paid the tribute (at first). But when there was a change in power in Tripoli they wanted more, and the price of the protection money went up. It’s not as feasible, it’s not as cost effective, it was actually more cost effective to pay the tribute than to maintain a Navy and send it half way around the world. It maybe made more political sense to stand up and say we weren’t going to stand for this any longer, so that President Jefferson sent over the armed gunboats. Bill Kelly: Unfortunately one of the mishaps in that war was the capture of the USS Philadelphia, a large frigate – a big battleship that ran around while chasing a pirate ship into Tripoli harbor. 300 men from the Philadelphia were held captive in the dungeons of the old castle fort, which is still there. Their Captain was Captain Bainbridge, the senior officer on the Philadelphia. John Morsa; Somers took his first ship the Nautilus out of Baltimore, sailed to the Mediterranean to meet up with Decatur who had his own ship, as well as Edward Preble, who was commanding the entire fleet from the USS Constitution, and they rescued the men from Philadelphia, and put down the Barbary Pirates. Bill Kelly: Now that the enemy had our biggest ship, Stephen Decatur took the captured pirate ship USS Intrepid, snuck into Tripoli harbor under cover of darkness, and with his crew, recaptured the Philadelphia and sunk it right there in the harbor. It was one of the first covert operations the US Navy undertook, and they were sort of like the Navy SEALS of their era. 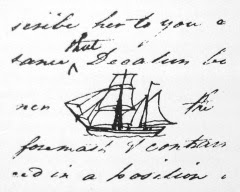 Because Somers and Decatur were always in competition with each other, Somers wanted to equal Decatur’s deed, and volunteered to sail the Intrepid back into Tripoli harbor laden as a fire ship, with a crew of twelve men who were supposed to light a fuse and escape in rowboats. But the ship exploded before it could reach the enemy fleet, and all thirteen men were killed. 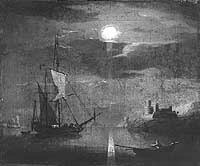 Their bodies washed ashore the next day and Captain Bainbridge convinced the Bashaw of Tripoli to allow them to recover their remains and bury them outside the castle wall. Mayor John Glasser: I can’t help but go back to the theme of the heroism these gentlemen displayed, and they were very young at the time. I don’t think Somers was out of his twenties, and to do this heroic deed. Then you think of the men who are serving today who are of that age and go into harms way defending this country. John Morsa: With increased funding from Congress the Navy and Marine Corps were sent over to get revenge against the Barbary Pirates. Bill Kelly: Captain Bainbridge had his chief surgeon Dr. Cowdery, Dr. Jonathan Cowdery identified the three officers from their uniforms and certain characteristics about them, and he separated them from the other men and they were buried in two graves outside the castle walls. And that’s where they remained. Eventually Decatur and the others would defeat the pirates and free the prisoners, but Somers and his men were left buried there. In 1850s James Fennimore Cooper wrote a history of the Navy and a biography of Somers and suggested that one day an American ship should put into Tripoli harbor, recover the remains of these men and bring them back. The Somers family has always thought the remains of Somers would be returned. The sister of Richard Somers, Sarah built a monument in Somers Point, which she thought would be the resting place for her brother and so people would remember that he was still in Tripoli. 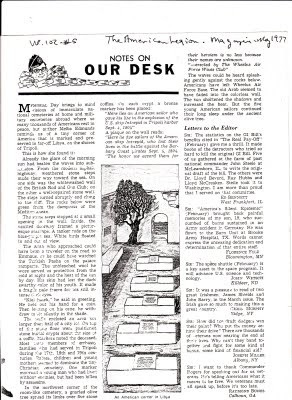 Then the American Legion came into the picture in May 1977 when American Legion magazine published an article by a women who was walking around Tripoli and accidentally stumbled upon the graves at the cemetery site. She wrote an article about it in the magazine that called attention to the fact that these men were still there. That led to a movement to attempt to return Richard Somers and the Intrepid crew. Mayor Jack Glasser: The fact that we left Somers and his crew there this long is unconscionable. I can’t believe it, but that’s what fills me with passion to keep pushing and to do whatever I can as mayor of this great town to bring them home. Walt Gregory: We want to bring them home to this town. That decision is fully up to the families, but we want to get these people – these heroes – and they are definitely heroes, and we want to get them out of the ground in Libya and put them in a place where they can be honored. Not at a place where at any minute they can throw them into the water if they decided they hate America. Where Richard Somers is, when Gadhafi stands on his pulpit and preaches to the people, and the crowds yell, they are standing in Green Square which is where Richard Somers is buried. They could be standing on his grave when they celebrate. Richard Somers had everything, and he sacrificed everything. His family owned Atlantic County, and he lost everything, he sacrificed everything for this country, and I think it is a shame, and it’s a big dishonor to the state and to the country, that he is not home. Barry Searle of the American Legion: Any service member who dies for their country at any time, in any place, in any era, for any reason, has the right to come home. The country we believe, has a duty and obligation to its service members who have sworn to give their lives to the country, to do everything they can to bring them home, in particularly when it is a case where there are family members who want to bring remains home, and there is a request to do that. There is a basic duty there that the country needs to fulfill. A service member takes the obligation when they raise their hand to defend the constitution at all costs, and there is an obligation on the part of the country to bring them home and take care of them. Mayor Jack Glasser: I am very proud, honored and thankful to the American Legion for supporting this effort. We need your help. We need every legionnaire’s help to contact their elected officials in Congress to support and sponsor Bill HR 1497– which will have the Department of Defense bring home the remains of Richard Somers and the crew of the USS Intrepid. Bill Kelly: There has always been a determination to bring these men home, and we think that now is the opportunity to do it. 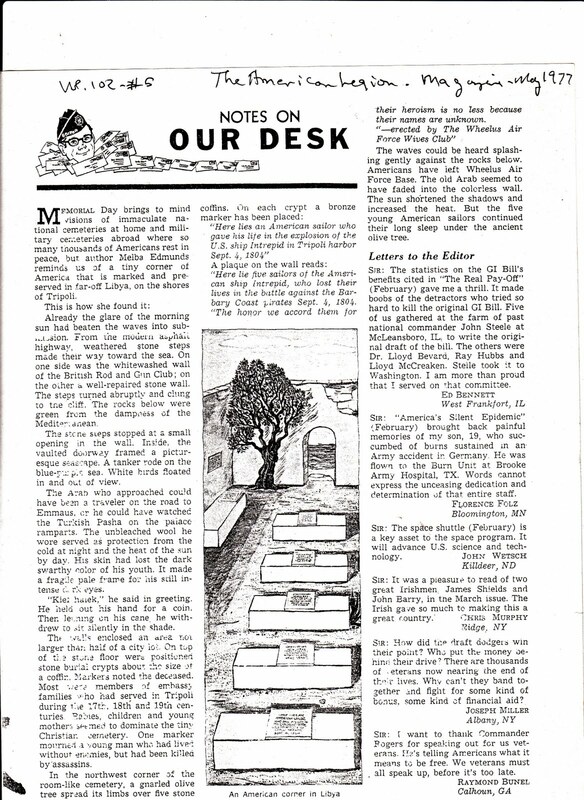 And just as the American Legion article in 1977 instigated that whole effort back then, we hope that you can help instigate the interest to bring them home today. Walt Gregory: I’ve been to Washington D.C. to see politicians about this; I’ve written letters to private citizens, I’ve written letters to everybody about this thing. And in my heart I think for the fist time that I think we are moving ahead now because the American Legion is involved in this. Because of the strengths of their different posts, they can get their Congressmen interested and we really have a chance to bring them home. We were just a voice in the wilderness, but when the American Legion takes it on its plate that this a just cause then, I think we stand a really good chance of winning this battle. Mayor Jack Glasser: We’ve been at it for so long that I can’t understand why. There is so much going on there now, but once the political situation stabilizes, I would hope that our government firmly stands behind this initiative and puts everything into place. And we have the resources, because we have done it in other countries, from World War II, Korea and Vietnam. We have the resources to do this, so let’s put these resources to this, and then bring them home. They died together in a massive explosion that tore their ship to pieces. The blast must have killed the entire crew in an instant. They died only yards away from a foreign, hostile shore of during an extremely dangerous mission. When their bodies washed ashore the next day, the enemy gawked at the disfigured remains for three days, and let stray dogs chew on the corpses. Then they were finally buried. Master Commandant Richard Somers and his crew of 12 died as heroes on Sept. 4, 1804, when their explosives-packed ship, the Intrepid, blew up prematurely off Tripoli, Libya. The crew, all volunteers, were on a mission to destroy enemy ships in the harbor. But something went terribly wrong in the final moments of that commando raid. Somers and his men died in battle, but they were never brought home for proper burial. Somers and his 12 shipmates were honored Sept. 17 during a ceremony in Somers Point, N.J. "Richard Somers Day" is held there annually to remember the sacrifice of these heroes, and to send a message to the federal government: It is time to bring the Intrepid crew back home. "With recent changes in the Libyan government, the chances of repatriation approval for the remains of Richard Somers and his crew appear to be to our benefit," said Sally Hastings, president of the Somers Point Historical Society. "Libya's new leaders may be willing to repay us for the help they received during their revolution. The graves of Americans who fought against their country long ago are probably not significant to them. I think we are in a better position than ever before." Jack Glasser, the city's mayor, also thinks the winds of political change in Libya will benefit efforts to retrieve the Navy heroes from Tripoli. "Now that the leadership has changed in Libya, our government must support the effort to bring the crew home," he said. "Now is the time to do it, because we may never again have an opportunity like this." Richard Somers Day ceremonies included remarks by Rep. Frank LoBiondo of New Jersey. He spoke to the crowd of the need for Congress to pass H.R. 1497 - an amendment to the National Defense Authorization Act (NDAA) for fiscal 2012 - that directs the Secretary of Defense to take necessary actions to bring Somers and his crew back home for burial. LoBiondo introduced the bill, co-authored by Rep. Mike Rogers of Michigan, last April, and it was passed by the House of Representatives on May 26 in its version of the NDAA. Hastings said this past Richard Somers Day included representatives from Somers, N.Y., named for the naval hero in 1808. Hastings presented them with a key to the city of Somers Point. "We continue to honor our local hero for being one of the first officers in the U.S. Navy, and the dedication he had in serving our country - even forfeiting his life while attempting to free his comrades," Hastings said. "Richard Somers, more than 200 years later, has not been forgotten." Glasser hopes that both houses of Congress will get behind the effort to bring Somers and his men home. "That would mean a great deal to the families, our city and to veterans everywhere," Glasser said. At its spring meetings last May, The American Legion passed a resolution urging the president and Congress "to support legislation and policies that will use all reasonable resources to achieve the fullest possible accounting of all missing American service members, regardless of location or era of loss." Tim Tetz, the Legion's Legislative director, wrote a May 24 letter to House Speaker John Boehner, asking for his support of H.R. 1497, authored by Reps. Mike Rogers of Michigan and LoBiondo. "There, within a forgotten cemetery, lie the remains of an American naval hero, Master Commandant Richard Somers, whose legacy inspires those still serving in the Navy," Tetz wrote. "There lie remains that family members have pled to have returned to the United States. It is therefore the opportunity and - more importantly - duty of Congress to direct that we recover the remains of those Americans within Tripoli.... The time has come to bring our heroes home." "Pro patria non timidus mori"
Evidence that the officers and men who paid for the construction of the Tripoli Monument - now at Annapolis - always intended for the remains of these men to be returned home and buried under the monument is referred to by Gregory Guderian, who writes about Somers and the Intrepid in the name of the New Jersey Latin Inscriptions Project. "Pro patria non timidus mori" may be understood to describe Somers as "unafraid to die for his country." "Hic decorae functorum in bello virorum cineres," or "Here are the noble remains (or ashes) of men who did their duty (died?) in war." I have not seen the monument in person, and it is reported that the Latin has either disappeared or been damaged to the point of illegibility. Some sources state that the monument included an urn on which these words were inscribed, while others say that the inscription appeared on its base. Given that Somers and the others were buried elsewhere, one cannot read too much into it. Best wishes for your ongoing research. Old Protestant Cemetery Site where five of the men of the Intrepid are buried. Celebrations at Martyr's Square, where eight of the officers and men of the Intrepid are buried. As the people of Libya cheer their liberation on Tripoli's Martyrs' Square, they are likely dancing on the graves of one of America's first naval heroes and his comrades. Today's celebrants would not be expected to know that since 1804, Master Commandant Richard Somers has probably been buried somewhere beneath what used to be Green Square. And therein lies a tale that is two centuries old, accompanied by a modern dilemma for a small town in New Jersey and an open question for the U.S. Navy. Our Navy was born as a response to the threats of the Barbary Coast pirates against American trading ships in the Mediterranean. In 1794, the U.S. determined to fight back with the creation of a naval fleet designed for the task. It was the work of the Navy's founding fathers - Stephen Decatur, William Bainbridge and Edward Preble among them. Richard Somers took command on Sept. 4, 1804, of the USS Intrepid as a fireship to be blown up in the midst of Tripolitan warships. But it exploded prematurely. The next day the mangled bodies of the ship's 13 crew were gathered from the beaches of Tripoli and buried in various places. Somers became the first named American military commander killed abroad in war and left behind. Somers was born about 1778 in what is now Somers Point, N.J. In 1980, the people of Somers Point began a campaign to return him to a final burial place that awaits him on the grounds of his grandfather's mansion, where Richard Somers Day is celebrated each Sept. 15. In 1804, there was barely a thought in the U.S. military that those killed abroad should be found and returned home, though by that time it was certain that the remains of perhaps thousands of anonymous American prisoners of the Revolutionary War still lay in the marshes of the military ports of England. By the War of 1812, however, recordkeeping had improved so that we can now name 273 known Americans still buried in Devon County, England and 195 in Halifax, Nova Scotia. By 1860, the Navy had also left behind 22 named sailors in Spain and Nicaragua. There are probably more to be found. The right of return for American war dead wasn't fully implemented until after the Civil War, and it excluded those who had died in earlier years. Until that time, there had been just two apparent official attempts to bring home military members buried abroad. America's first certified naval hero, John Paul Jones, had died as a man without a country in Paris in 1792, his remains lost in an obscure cemetery. In 1906, President Teddy Roosevelt, a good marketer, sought to gain public support for strengthening the U.S. Navy. "Find me the body of John Paul Jones!" he exclaimed (or words to that effect). A body believed to be that of Jones was found beneath the slums of Paris after several years' effort and interred at Annapolis amid great celebration. In 1938, President Franklin Roosevelt, for reasons that were less transparent, made the same declaration about Richard Somers. But by the time his presumed burial place in Tripoli was found, the rest of the world had moved on to World War II. Since 1980, the people of Somers Point have felt that just because Somers was killed at a time when he couldn't be brought home doesn't mean that he shouldn't be brought home. If John Paul Jones could be returned in 1906, why can't Somers make his own return in 2011? That outcome is state policy in New Jersey. Repatriation of all the Intrepid sailors is sought on a current rider to the Defense Authorization Act of 2012. Events in Libya have made the question more provocative. Some who advocate for Somers believe that, like the two Roosevelts before him, Barack Obama might find a political reason to reflect on Somers and the long, complicated history between the U.S. and Libya. Indeed, in the days before the revolution, even the Libyans seemed favorable to the idea of his return. But the U.S. Navy is not. In a March 11, 2010, letter to Bill Kelly, one of the leaders in the Somers Point effort, Chief of Naval Operations Adm. Gary Roughead said that though it was certain that the Intrepid crew was buried in Tripoli, five of them unnamed in a Protestant cemetery, the actual grave of Somers could not be found and verified by Navy standards. "My staff," said Roughead, "is working with the Department of State and the American Embassy in Libya to ascertain the condition of the graves and what actions can be taken towards their long-term care." That was before the liberation, or hopeful steps in that direction, of the Libyans themselves. It can be predicted that the liberation of Richard Somers and his comrades will be a continuing goal. The technology exists to help the task, and times are different. 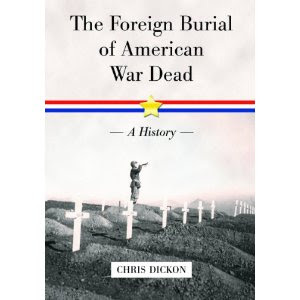 Chris Dickon is author of "The Foreign Burial of American War Dead." He lives in Portsmouth. This Saturday, Sept. 17 at 11 a.m., LibertyAndProsperity.org, the Somers Point Historical Society and the city government of Somers Point will jointly sponsor a program to remember Richard Somers. He was born in 1778 in Somers Point when it was part of Egg Harbor Township. Somers and 12 others were killed 26 years later, on Sept. 4, 1804, when their ship, the Intrepid, exploded in Tripoli harbor, while trying to destroy the ships of Arabs who were killing, robbing, and enslaving Americans. This was because we were the only non-Muslim nation with ships in the area that refused to pay them tribute (protection money). We invite you and your family to attend this event at City Hall, New Jersey Avenue and Shore Road in Somers Point. There is no admission charge. However, LibertyAndProsperity.org also invites you all to a fund-raising lunch immediately afterward at nearby Gregory’s Restaurant and Bar for $25 per person, $30 per couple. The story of Richard Somers is interesting and relevant to Americans today for many reasons. At one time every American learned about him in elementary school. But today, very few know much about him – even in Somers Point. Somers was typical of that first generation of Americans who grew up right after the Revolution. He, like almost all American children then, mastered basic reading, writing, and arithmetic by age 12, even though there were no taxpayer-funded public schools. Back then, Americans in every community volunteered enough time and money to give every child a basic education. They also formed volunteer associations for libraries, fire, and police protection. As a result, Americans paid almost nothing in taxes and kept almost everything they earned. Like most young Americans then, Somers also learned the skills he needed to earn a living by the time he was a teenager. As a child, Richard Somers learned to sail small boats up and down the river between Somers Point and Mays Landing. As a teenager going to high school in Philadelphia, he worked summers as the captain of ocean-going sailing ships carrying goods between New York and Philadelphia. In those days, only property owners were qualified to vote in most states. But since only property owners paid taxes, even those without property thought this was fair. Why should people who paid no taxes elect officials with the power to decide how much the people who did pay taxes should pay? Besides, almost everybody in New Jersey owned property back then except young people starting out. Unlike in Europe, Americans did not need special licenses or permits from the government to clear fields for farms or build homes, factories or workshops. With unlimited opportunity and almost no taxes, most Americans became prosperous property owners by their mid-20s. Women usually married then, and were partners with their husbands. But in 1798, 20-year-old Richard Somers chose a far different life. French pirates were attacking and robbing American ships near the Caribbean. When the French government demanded payoffs to stop the attacks, Americans shouted, “Millions for defense! Not one cent for tribute!” Congress responded, spending millions of dollars to build warships and a new Naval Academy in Annapolis, Md., to teach Americans how to use them. Richard Somers and his school roommate Stephen Decatur were among the first to enroll in Naval Academy. As midshipmen (students), they served on the new American ships that crushed the French pirates within a few months. Then they both made their careers as navy officers. Three years later, warships from several Arab kingdoms in North Africa captured American ships, seized their cargoes, and sold their crews and passengers into slavery or held them for ransom. In 1801, Congress gave President Thomas Jefferson permission to send our new navy across the Atlantic to fight them. We Americans would not be like the Europeans who paid off the pirates to leave their people alone. Richard Somers and Stephen Decatur were each 23 years old when they were put in command of their own warships. But they and the other young Americans out-sailed and out-fought the fanatical, experienced, and well-equipped Arab sea fighters until every Arab kingdom in North Africa except Tripoli (now Libya) made peace with America. Official Days To Honor American Heroes Go By Unnoticed. The New Jersey State legislature officially designated September 4th as Richard Somers Day in the State of New Jersey. The New Jersey and Pennsylvania state legislatures and the Congress of the United States have officially designated September 13th as John Barry Day, and the President of the United States has proclaimed September 16th as National POW/MP Day. 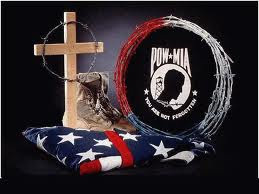 Prisoner of War – Missing Persons Day is meant to honor all of those American service personnel who went missing or died overseas and are buried in unknown graves abroad. Richard Somers day isn’t celebrated on September 4 - the day he died in Tripoli while fighting Barbary pirates, because it generally falls over the Labor Day holiday weekend, so Somers Point holds a Richard Somers Day ceremony a week or two later. This year Richard Somers will be honored at the Somers Point City Hall on Saturday, September 17, when Somers Point will host officials and historians from Somers, New York, a town named after Richard Somers. Somers, the grandson of the Quaker founder of Somers Point, attended the Philadelphia Free Academy with Stephen Decatur and Charles Stewart, and all would become protégés of Captain John Barry. Barry is recognized as the “Father of the U.S. Navy,” not because of his Revolutionary War exploits, or the fact he was the first flag officer of the new reconstituted Navy, but because President Washington ordered Barry to raise a class of midshipmen to become the first young officer corps of the new Navy. Before assuming command of the frigate USS United States, Barry was responsible for the boat’s construction at what is now the South Philadelphia Navy Yard, and young students - Somers, Decatur and Stewart helped build it. Because he was oldest, Stewart became Barry’s first officer and Somers and Decatur the first two Midshipman, who would go on to command their own schooners – Somers the Nautilus and Decatur the Enterprise. Both Somers and Decatur would capture pirate ship prizes, with the Enterprise taking a corsair ketch they rechristened the Intrepid. After the frigate Philadelphia was captured by the pirates after running around at Tripoli harbor, Decatur used the Intrepid on a covert mission into Tripoli harbor to recapture and sink the Philadelphia. When Somers then took the Intrepid, converted into a fireship outfitted with combustibles, back into Tripoli harbor in the dark of the night on September 4th 1804, it suddenly exploded before it should have, and all thirteen hands perished. The next day their bodies were collected on the shores and American prisoners from the Philadelphia buried them just outside the walls of the old castle fort in what is now Martyr’s Square. In his new book The Foreign Burial of American War Dead (McFarland Publishing, 2011), Chris Dickon notes that Somers and his men were the first identified and recognized American combat casualties who were buried overseas (other than Revolutionary war soldiers in England), and apparently they will be the last to be repatriated home. Charles Stewart and Stephen Decatur would continue the fight and Decatur would return to lead the US forces in winning the Second War against the Barbary pirates, which was required because of the repeated violations of the treaty that ended the first war. All of these men – John Barry, Charles Stewart, Stephen Decatur and Richard Somers, and the ships they sailed – Nautilus, Enterprise and Intrepid - have been recognized and honored by having warships named after them. The USS John Barry is deployed off Africa today, is actively engaged in fighting pirates and fired Tomahawk missiles into Tripoli during the recent conflict. While John Barry Day, Richard Somers Day and National POW/MP Day usually pass unrecognized, this year they all fall within a week of each other, so maybe they will be remembered. In a presidential proclamation, President Barack Obama said, "'Until every story ends' is a solemn promise to those who wear the uniform of the United States that they will never be left behind or forgotten. On National POW/MIA Recognition Day, we pay tribute to the American men and women who never returned home from combat, to those who faced unthinkable suffering as prisoners of war in distant lands, and to all servicemembers who have defended American lives and liberties with unwavering devotion. As a grateful Nation, we can never repay the profound debt to our heroes, and we will not rest until we have accounted for the missing members of our Armed Forces." "We demonstrate our deep gratitude and admiration for our brave patriots not in words alone, but in our actions to bring them home. Each year, specialists in our Department of Defense scour foreign battlefields and burial sites, interview witnesses, and search national and international archives for information about those missing from the Vietnam War, Korean War, Cold War, World War II, and other conflicts. Their work will not be complete, nor our commitment fulfilled, until the families of those taken or missing in action can rest knowing the fate of their loved ones." It is a week that begins on Sunday with the anniversary of September 11. John Barry Day is Tuesday September 13th, National POW/MP Day is Friday, September 16 and Richard Somers Day is being celebrated on Saturday, September 17. 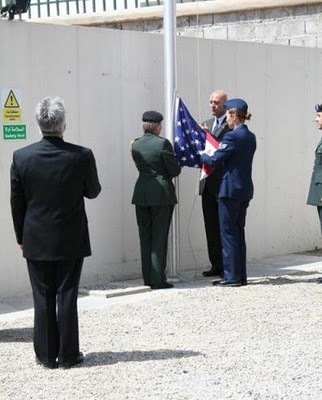 As these days transpire and these heroes are remembered and honored, let us also remember that Richard Somers and the remains of the officers and men of the Intrepid lay in an unmarked and desecrated gave under a parking lot at Martyr’s Square in Tripoli. It should also be known that the US Senate is considering the Defense Authorization Act of 2012, passed by the House with the Rogers/Lobiondo amendment that calls for the repatriation of the remains of the men of the Intrepid. If the Rogers/LoBondo amendment is included in the Defense Authorization Act when it is passed by the Senate, the repatriation of these American heroes from Tripoli will be accelerated, and they can be given the homecoming and proper burial they deserve. 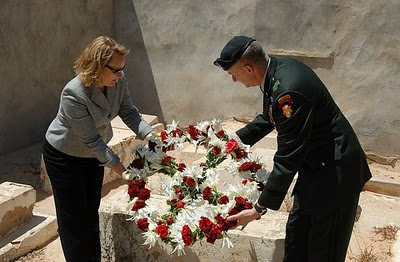 MEMORIAL DAY brings to mind visions of immaculate national cemeteries abroad where so many thousands of Americans rest in peace, but author Melba Edmunds reminds us of a tiny corner of America that is marked and preserved in far-off Libya, on the shores of Tripoli. Already the glare of the morning sun had beaten the waves into submission. From the modern asphalt highway, weathered stone steps made their way towards the sea. On one side was the whitewashed wall of the British Rod and Gun Club; on the other side was a well-repaired stone wall. The steps turned abruptly and clug to the cliff. The rocks below were green from the dampness of the Mediterranean. The stone steps stopped at a small opening in the wall. Inside, the vaulted doorway framed a picturesque seascape. A tanker rode on the blue-purple sea. White birds floated in and out of view. The Arab who approached could have been a traveler on the road to Emmaus, or he could have watched the Turkish Pasha on the palace ramparts. The unbleached wool he wore served as a protection from the cold at night and the heat of the sun by day. His skin had lost the dark swarthy color of his youth. It made a fragile pale frame for his still intense dark eyes. "Kiel haiek," he said in greeting. He held out his hand for a coin. Then, leaning on his cain, he withdrew to sit silently in the shade. The walls enclosed an area not larger than half a city lot. On top of the stone floor were positioned stone burial crypts about the size of a coffin. Markers noted the deceased. Most were members of the embassy families who had served in Tripoli during the 17th, 18th, and 19th centuries. Babies, children, and young mothers seemed to dominate the tiny Christian cemetery. One marker mourned a young man who had lived without enemies, but had been killed by assassins. "Here lies an American sailor who gave his life in the explosion of the U.S. ship Intrepid in Tripoli harbor Sept. 4, 1804." "Here lie five sailors of the American ship Intrepid, who lost their lives in the battle against the Barbary Coast Pirates Sept. 4, 1804. The honor we accord them for their heroism is no less because their names are unknown. - errected by The Wheelus Air Force Wives Club." The waves could be heard splashing gently against the rocks below. Americans have left Wheelus Air Force Base. The old Arab seemed to have faded into the colorless wall. The sun shortened the shadows and increased the heat. But the five young American sailors continued their long sleep under the ancient olive tree. This sketch by G. Brooking is one of only a few pictures of the Intrepid. Does anyone know anything about G. Brooking and what year he did this sketch? It was 207 years ago today that Master Commandant Richard Somers led a crew of twelve men aboard the USS Intrepid into Tripoli harbor on a covert, nighttime mission to destroy the anchored pirate fleet. Instead, the Intrepid exploded in the harbor and all thirteen men perished. The next day their bodies were recovered and buried "one cable's length" from the old castle fort at what is now Martyr's Square. Today, the American naval heroes are the only real mratyr's buried at Martyr's Square, which for the most part is a paved over parking lot used for mass rallys, demonstrations and celebrations. The effort to have the remains of these men repatriated home so they can be properly buried has reached a tipping point in the US Senate. Since the House of Representatives has passed the Rogers/LoBiondo repatriation amendment to the Defense Authorization Act (DAA) that is now being considered by the Senate, it is up to the Senate to include or reject the amendment as part of the DAA bill. It only takes one Senator to oppose the measure for it to be defeated, and that is the most likely outcome since the US Navy, the DOD and at least on officer who works for the POW/MP office are opposed to it. Contact your representatives in the Senate now and ask them to support the Rogers/LoBiondo Amendment to repatriate the remains of the US Navy heroes from Tripoli. Map of Tripoli Harbor showing the routes of the USS Intrepid in February 1804 when Stephen Decatur recaptured and sunk the frigate USS Philadelphia and where the Intrepid exploded on September 4, 1804, killing Master Commandant Richard Somers, Lt. Henry Wadsworth, Lt. Joseph Israel and ten men who are now buried on the shores of Tripoli harbor. Five are located at Old Protestant Cemetery and eight, including the three officers, are buried in an unmarked grave under a parking lot at Martyr's Square. 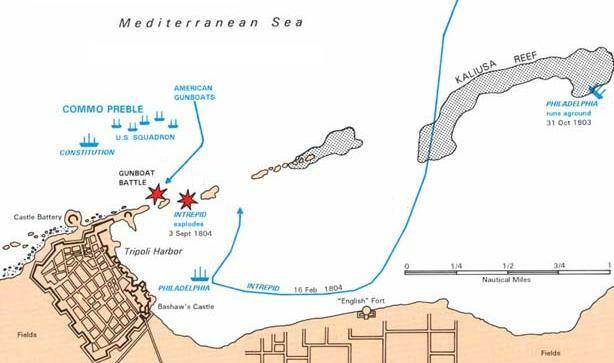 On May 14, 1801, when the US Ambassador to Tripoli informed the Basha Yousef Karamanli that the US would no longer pay the $225,000 annual tribute to him in exchange for not pirating American merchant ships, he chopped down the flagstaff in front of the US Consulate and declared war on the United States. 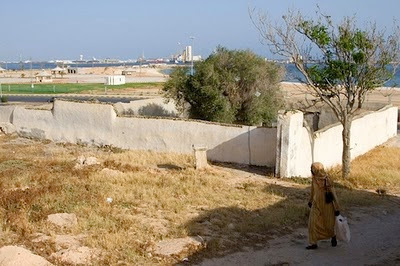 TRIPOLI, Libya — Looted, ransacked and burned, the U.S. Embassy complex in Tripoli stands in ruins, a testament to the violence unleashed in the name of Moammar Gaddafi’s regime and its disregard of international law. Throughout the embassy compound, everything that could have been broken has been. Balustrades have been ripped off, photocopiers and air-conditioning units smashed to smithereens, cabinets wrenched open and overturned. Whole floors were doused in gasoline and burned. Embassy documents, including torn photographs of Secretary of State Hillary Rodham Clinton and Vice President Biden, carpet the floors that escaped the flames. The embassy was ransacked in the early hours of May 1, as were those of Britain and Italy, in response to the death of Gaddafi’s son Saif al-Arab and three of the Libyan autocrat’s grandchildren in a NATO airstrike. At the time, Libyan Deputy Foreign Minister Khaled Kaim said mobs, some in the hundreds, had attacked the lightly guarded embassies. Kaim called it a “regrettable” event that outnumbered police forces were powerless to prevent. But interviews with neighbors and witnesses paint a different picture of events that night. They said that roughly 20 people arrived at the U.S. Embassy complex about 2:30 a.m. in the trademark Toyota Tundras favored by the Libyan security forces and that at least some of them were in army uniforms. They used a shotgun or heavy machine gun to blast open the compound’s imposing steel doors, witnesses said, before calling others to join them. Witnesses said the group looted some items from the embassy, including televisions and chandeliers, and left about 4 a.m. 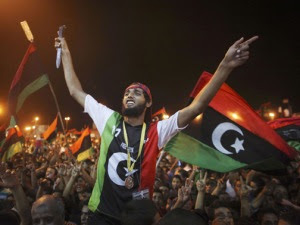 But in the subsequent hours, busloads of cheering and chanting Gaddafi supporters apparently showed up in what neighbors said looked like an organized excursion. By morning, smoke was rising from several of the buildings in the embassy compound. Neighbors said policemen told them that they were under orders not to prevent the looting. The Gaddafi regime’s green flag was draped on the embassy roof, and its slogan, “Allah, Moammar, Libya, bas [that’s all],” was daubed on the walls. There were similar events at the British ambassador’s residence that morning, another witness said, with mobs sauntering through the complex while police sat and watched, the elderly caretaker of the building in tears at the destruction of its collection of priceless antiques. The U.S. Embassy was more modern and nowhere as grand as the British properties. But the sense of loss at the destruction was no less real for the American staffers as they later watched a video posted on YouTubethat showed the looters casually wandering through the wreckage in broad daylight. The embassy had been abandoned in February as Tripoli erupted in gunfire, a Lonely Planet guidebook to Egypt and a half-finished bag of Doritos evidence of the haste in which staff members left. It was first U.S. diplomatic mission to shut completely in 12 years. Deputy Chief of Mission Joan Polaschik, whose business cards still litter the floor, stayed up the night before the final evacuation, destroying computers. After a hair-raising escape from Libya, staff members eventually reunited in Washington to set up a sort of embassy-in-exile. This week, State Department officials declined to speculate on when they might be able to reopen the embassy, a symbolically important event that will further convey U.S. support for the rebels’ Transitional National Council as the legitimate government of Libya. The Obama administration’s special representative to Libya, Chris Stevens, has been working from the eastern city of Benghazi, where much of the rebel council’s leadership remains concentrated. U.S. officials are preparing to send an advance team to Tripoli to assess security and gauge the extent of damage to the embassy.